Leveraging on our experience since 1968 in this domain, we have been successfully providing our customers with Tact-Switch, Push button & Hook-Switch and Key-Switch. 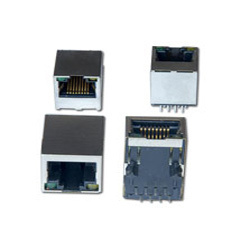 In addition to these, we offer Modular Jacks, Connectors, Trimpots, Helipots, LED’s & Displays. All our products are sourced from the reliable manufacturer such as Amphenol Interconnect India. Pvt. Ltd, Pran Electronics, Vision Opto-Electronic Industries and Orion Industries. Used in Industrial electronic industries, our products conform with the international quality standards & norms. We have a capacious warehouse, which helps us in successfully storing all procured products in a systematic manner. Our warehouse is spread over a vast area and is well-equipped with latest material handling and fire fighting instruments. In addition to this, our team of expert professionals utilizes all the available resources for meeting the exact requirements of the market. It also helps us in understanding the exact demands of our clients and fulfilling them in a better manner within the stipulated time frame. Further, we provide our clients free samples of the products to give them a chance to select as per their needs. All these factors have enabled us to muster a huge client base that consists L & T, ABB and Siemens, to name a few.